A great announcement yesterday, with the Government confirming it will fully fund SkyPath. The government has announced it will fully fund a walking and cycling link across the Auckland Harbour Bridge. It has confirmed this afternoon that $67 million of the National Land Transport Fund will be invested in the link, known as SkyPath. The SkyPath pedestrian and cycle pathway across the bridge was given the green light in 2016 with the Environment Court granting the project its resource consent. Transport Minister Phil Twyford said SkyPath was a transformational project that would give Aucklanders the freedom to walk and cycle from the North Shore to the city. “SkyPath is the obvious, critical missing link in Auckland’s cycle network and will become an iconic feature of Auckland’s Harbour Bridge. “SkyPath has been talked about for over a decade, but it now has the funding certainty to move ahead,” said Mr Twyford. A detailed business case, which will provide more certainty around the design and timing of the project, will completed by NZTA by the middle of next year, Mr Twyford said. This has been a long time coming, 59 years since the bridge first opened and nearly 10 years since it the SkyPath idea was first developed as the result of a protest over whether Aucklanders were allowed to celebrate the Harbour Bridge’s 50th anniversary by walking across it. In the intervening years, there’s certainly been plenty of work by a lot of dedicated people to get the project to this point. I think enormous credit needs to go to the team who volunteered years of their lives to making this happen. Auckland owes a great gratitude to Bevan Woodward, Barbara Cuthbert and Max Robitzsch, alongside many others. This would not have happened without your persistence. Hopefully confirmation that the government will fully fund SkyPath means that it won’t need to be tolled. It always seemed incongruous that you’d need to pay to walk over the bridge when you can drive over it for free. 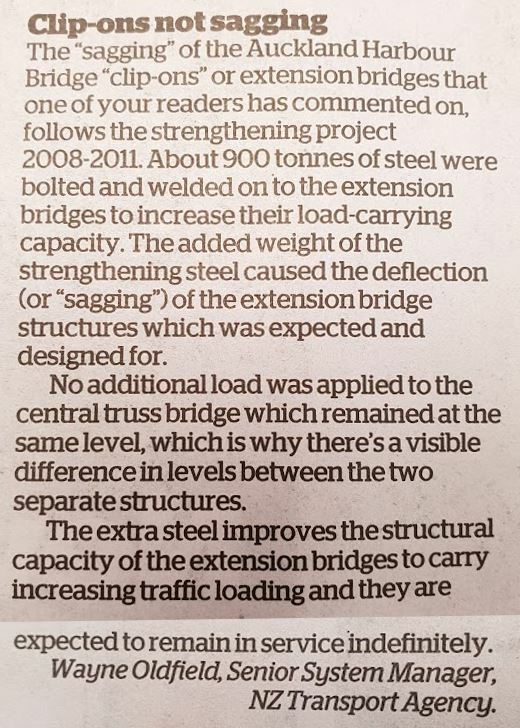 Finally, semi related to this and the issue of another harbour crossing, this letter to the editor appeared in yesterday’s Herald from the NZTA. It comes in the wake of the terrible bridge collapse in Genoa with some people worried about the state of the Harbour Bridge. Remaining in service indefinitely seems like a long time. Guess just another reason why we can focus future effort for crossing the harbour to be via transit and active modes. Now we just need to get rapid transit across the harbour, too. +1 – take the eastern clip-on lanes I reckon! Chapeau to all who spend endless hours working on this! Yet still there are a handful of clowns in Northcote banging the drum against it. People are raising lots of valid safety concerns, like the clip-ons not being strong enough. I’m also concerned that if Skypath is not made long enough, people will just fall down into the harbour before they get to the end. Or if it is made from solid sodium it will explode when it rains. This will result in a massive pile of corpses in the harbour and severed limbs smashing car windscreens in Northcote Point. Don Mathieson from the Herne Bay Residents’ Association has brought up an interesting point but needs to learn a bit about parking. The worst thing they could do is increase parking near the ends of the Skypath, which would bring his fears alive and encourage people to think of it as something you would drive to. Provision of parking is the strongest predictor of increase in parking demand, and that’s exactly what would happen here. This isn’t Woodhill, this is a connection in the cycle network. I plan on driving to it. It will be the thing to take visitors to now that you can’t drive them up Mt Eden. Drop them off one side and pick them up on the other. that means we will need parking on both sides.Add it to a drive along Tamaki Drive and a visit to the gannets at Muriwai. 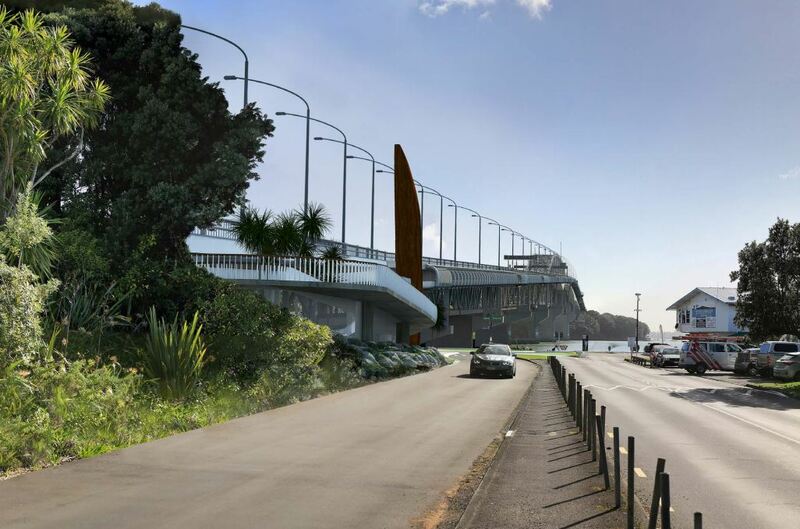 There is a very valid concern that if they build the skypath upside down, people will be forced to walk on their hands, and when they get half way down they’ll drown in the harbour. Impressive gradients on this skypath, bikes could go a fair lick downhill. That would make for interesting dodging manouvers, leaping pedestrians, flying zimmer frames..
Will there be speed cameras installed? Don’t worry if there are any bike vs pedestrian crashes they will be able to ban people on bikes. There will be no smoking and people will keep their shoes on. If you passivate the surface with wax, it will also allow pedestrians to make travel-time savings on the down-slope. That’s why they need 10 months for the business case, then. Some experiments with wax are needed to calculate the travel time savings. Fantastic sarcasm, entirely appropriate to the blatant concern trolling from the ‘local residents” associations. As a non Auckland resident who may never use the facility i also can see this is a great project. So well done with the lobbying to gain government support. But a very small piece of transport infrastructure that nevertheless affects many (often low income) New Zealanders and overseas travellers seems impossible to upgrade. It would take mere loose change compared with the Skypath. These are the toilets at the InterCity depot in Auckland. The poor state of these toilets have been mentioned before on this site. But for some reason no progress seems to be able to be made in bringing them up to the standard travellers would expect at places like Auckland airport. They’re owned and maintained by SkyCity AFAIK and they’re doing everything they can to get the bus terminal closed and moved, so I’m not surprised the facilities are revolting. Yes its an odd situation that stretches back to the land swap deal done to build the casino in the first place. Originally the land sky city sits on had been bought and owed by the city to build a bus terminal for north shore and western buses. The sky city crowd managed to convince the city to swap that prime land for an old rubbish tip by the motorway in Newton, currently home to some shoddy terraces. But as part of the land swap deal the ‘savvy’ city tacked on a rider that sky city would have to build and run an intercity bus terminal as part of the casino, maintaining some tokenistic transport function that made the plan change easier. Sky city never wanted a coach terminal and have been neglecting it since day one. In fact they’ve been lobbying to have it removed so they can expand their floor area and frontage. TBH we probably should let them buy out of the deal and fund part of a new terminal elsewhere. The basement of the convention centre might have been the spot, if they could handle giving up a hundred car parks. But surely we have standards for facilities that include provision for nappy changing and drinking water? It feels like there must be some regulation somewhere that isn’t being used because it would bring things to a head, or something. I imagine unless that was specifically included in the original agreement then they are under no obligation to provide it. I like the idea of letting Skycity buy out the contract, but where would the bus terminal go? The road isn’t very nice, being a de facto motorway and polluted as anything, but it’s a convenient location for people to reach and for the buses to get to/from the motorway. Honestly the only place I can think of to place a replacement terminal is in the vicinity of Spark Arena. Replace Railway Carpark with a bus terminal, thus tying the service in with domestic bus and train, with segregated cycling infra right outside. Failing that, Quay St by Tapora St? An intercity bus terminal should be as close as possible to Britomart to allow easy transfers to heavy rail, future light rail, ferries and city buses (including the airport bus). I’m not sure where you’d fit such a facility though. Britomart muliti-storey carpark or Countdown are the only large bits of land left in that area, and will already have stacks of buses in the area following the upcoming reconfig. An alternative is to incorporate a coach station into the new stadium built behind Spark on the railway land. New Quay Park rail station would service. Easy road access via Grafton Gully. To replace what they have, but closer to Britomart, what do they need? Wouldn’t it just be one block of a side road – 80m or 90m should do it, but there are some 100m or 120m long blocks – dedicated to the buses, made into a one-way road, with all the parking on one side being the bus stops. Plus some indoor offices, waiting areas and facilities in a neighbouring building. Of course elsewhere there’d have to be bus layover areas, but I’m imagining that’s already what’s required. It doesn’t seem hard to me, but maybe I’m missing something? Actually, where it is is fine, as it’ll be close to Aotea station, all the buses on Wellesley St, and not much further to the light rail. They just need to improve the factilities and keep them properly cleaned, Intercity needs to improve its customer service, and AT needs to provide information and a HOP card dispensing unit. Sky City can just get with the programme. The perfect terminal location is 20m from the existing one on the lanes that need to be removed from Hobson Street. It is currently 6 lanes wide. Let’s reduce that to two and build a bus station. There is valuable space above the CRL tunnel and the road surface in Albert street that could have been used as an underground bus terminal (or anything) instead it’s going to be filled in with dirt. Big thanks to the SkyPath teM who have demonstrated such tenacity in getting this far. Please explain to me why NZTA needs the next six months for a ‘business case’. I always thought business cases were written to investigate financial viability PRIOR to approval. Well approval has been given and funds allocated by my read of that press release so why do we need a business case. The cynic in me sees this as another delaying tactic. Just get on & design & build the thing. By the middle of next year could be ten months; does seem long. The business case will be useful, though, in changing mindsets about the worth of doing projects like this – plenty of people just don’t understand how much we’re paying for our inactive population’s poor health, poor social outcomes due to poor access, and poor environmental outcomes due to limited transport choice availability. Also, I imagine a lot of the time will be spent on the design details, which obviously are unique to this project. Fantastic news, and yes well done to Bevan, Barbara, Max and the others who worked so hard on this. So many more people will be able to have the active lives they want, and to feel the parts of the city are now physically connected instead of just reachable in the abstract by motor vehicle. A victory for thoughtful and persistent advocacy to resolve issues. I look forward to being able to use Skypath in the not too distant future. I read that letter in the Herald. It has the title ‘Clip-ons not sagging’ then goes on to explain why the clip-ons are sagging. My husband’s been telling me for a while that sagging isn’t a bad thing. It’s all about strength. How that clipping reads, the clipons are both sagging and hogging – These are exclusives, so no… Perhaps the commentators meant bending? If I were to be pedantic (of course I will be), deflection is any change in the geometry of a solid object in response to a set of forces (generalizable to pressures/stresses) imposed on it. Bending is more specific; it is a particular type of deflection. If one considers a set of points in a solid object that initially constitute a straight line, after bending, those points lie along a curved line confined to a plane. Examples of deflection other than bending are compression along one or more axes (A notional straight line remains straight.) and twist (Line becomes helical.). I agree it is unclear. It’s difficult to succinctly make the distinction between a bridge that is sagging under it’s own weight and a bridge that is progressively sagging further due to ongoing failure. I did the Bridge Walk a few years ago and when you are around the centre of the spans at the road deck level the flexibility of the structure becomes very obvious, especially when a heavy vehicle passes over. The bridge, after all, is built from steel, which is remarkably elastic over long distances. The bridge guide pointed out that what appears to be a single structure is, in fact, a set of three parallel bridges in close proximity. The clip-ons are not attached laterally to the original structure but simply rest at the ends on the same main piers as the first bridge. All three flex independently of one another depending on the deck loadings at any given moment. So is it going to be free? http://www.skypath.org.nz/frequently-asked-questions/ – 11. How much will it cost to use SkyPath? Personally, I can’t see visitor numbers covering opex even if you charged $20+ per person. Pretty sure that information dates from a time when the Skypath Trust was proposing to build it under a PPP model. The government is now proposing to pay the whole cost and make use of it free for everyone. I think that information is probably accurate. As it was never intended to be free for HOP Card users under the PPP model, previously it was expected that HOP users would pay less than casual users/tourists would. Same as HOP users pay less on buses and trains now over casual/cash fares. To encourage use of HOP cards. So the fact it says “free for HOP card users” implies a change from the previous expected $2 each way toll for HOP card users when it was a PPP. In any case, NZTA will still need to control the numbers of people & bikes etc on the Skypath at any one time for both safety and load management purposes. So a turnstile of sorts at each end will likely still remain in place in the design to capture entry and exits. So that they know how many are on it, and also so that they can limit the numbers on it at peak times. And therefore, a HOP card will likely remain/be your access method to access the Skypath, even if the cost if $0, makes for easy tracking of when people enter and exit the Skypath structure, in case of emergencies they know how many are “out there”. While the clip ons are strong, they are not infinitely strong. And the Eastern clip on is the least loaded of the two clipons with regards existing traffic loads, which is why the Skypath is to be built on that side of the bridge. So there is a limit to the total weight added to the eastern clip on via the Skypath itself and the numbers of people using it at any one time. I can understand the requirement for observation of traffic flows in the same way that the current vehicular traffic is monitored by fixed cameras but it’s not clear what constitutes an ‘operating cost’ for a cycleway and footpath. Surely the cyclists and pedestrians are essentially self-operating. What costs are incurred and by whom? Keeping it clean, well-lit, safe? Security is a bare-minimum. Try looking at it from the point of the most vulnerable user. As this is a new design it will have to go through resource consent again. Having a business case will be helpful for that process and interesting to see the outcome, should the business case not prove positive. There will still be a need for security as the bridge weight needs to be managed. There will also still be restricted hours of use, because the residents rights will be protected. As one of the local residents – I am glad that the project has been taken away from a bunch of cycle nazis and given to professionals. NZTA are likely to address all the many design flaws and come up with actual designs – not fluffy bunny artist impressions. NZTA will also address the issues of parking and traffic management, as well as a northern landing that works. Given the budget is now 3 times the original ‘promised price tag to rate payers’, it could be that some of the houses will be purchased by the Government and that will allow a much better facility. You can also guarantee that safety issues will be addressed to stop muppets riding too fast. I would guess that there will be barriers every 100m that will require cyclists to dismount. While I can already sense your angry reaction to this – get over it as safety should always come first! Local dude – I don’t think that it will have to get a new Resource Consent – why would it? The Resource Consent was granted for a structure for the purposes of cycling on, and that hasn’t changed. The business case is being tweaked, but that is not really a matter for consideration of / by the Environment Court. Updates to the conditions of the RC can be managed reasonably easily. As far as I see it, there is not really any need to go back to court. Ignore him, he’s just a miserable troll that has been fighting this for years because he doesn’t like the idea of people being able to go near his house and thinks everyone should be jealous of him for living under a motorway. Keeps coming up with spurious concern trolling, and keeps being proven wrong. ‘The Transport Agency recently took over the SkyPath project and is currently developing a detailed business case to determine the preferred design option and timeline for construction, and to further develop project costs and benefits to confirm the economic case for the project’ and goes on to say ‘Assuming the detailed business case confirms the economic case, the SkyPath project will be able to proceed to implementation, with construction beginning after the necessary designs are complete and consents in place’. It is pretty clear that a re-design is quite possible and then an application would be needed to the council for a new RC, or that a new resource consent may expire before the project gets off the ground. The business case will also be interesting. NZTA will deal in facts and not figures produced by bodies with vested interests (Bike Auckland, Skypath Trust etc). Remember this is a 67m dollar project and not the grossly understated 25m that was being sold to ratepayers. Making a business case for that sort of spend, based on cycle figures may become difficult. As for Nick R’s comments – pfft… I am very happy the project is in the hands of NZTA and away from the amateurs. NZTA will take a much more balanced and reasonable approach to residents than has been taken by the Skypath Trust. I trust NZTA will find a solution that works for everyone and then my 2m home ‘under the motorway’ will probably gain in value. Agree, it should always have been in the hands of the NZTA as they own the bridge. They should have been building it 10 years ago, or really 59 years ago by the Ministry of Works. It should never have been left to a group of private citizens to do all the work to get it on the agenda. I imagine the business case will be assessed on pedestrian and cycling numbers, not just cycling numbers. My understanding is that the bridge has been one mistake after another. Originally it was supposed to have rail and footpaths, but they decided to skimp on costs. Then – as it was completed in 1959, the original construction company offered to build a second identical bridge at no cost – so long as they could keep the tolls for 20 years. We didn’t go for that idea and less than 10 years later, we paid for the clip ons. It’s an ugly bridge (IMO) and I personally would rather it was removed and replaced with cross harbour tunnels (road and rail). My second option would be to build a heavy rail tunnel that goes to Albany, with a spur to Takapuna (That big car park would be great as a rail station and high rise complex. Sadly, we never look far enough into the future for things to be done properly. Now that NZTA is in charge and has a decent budget. Between Skypath and Seapath the money is eye watering and this project should be done properly. The Northern Landing in its current design does not work. Even if you dont car about the residents concerns, the zig zag to get from Princes Street to the start of the path would be a pain in the saddle. The connection to Sea Path is also badly conceived. Very few people will cycle to and from Northcote Point, so it make a lot more sense to continue the Skypath clip on all the way down to sea level at Sulfur Beach. This means a better looking design and caters for the majority of the cycle traffic, that will come from/go to north of Onewa Road. A smaller entry/exit point could exit to princes Street by coming off under the bridge at the grassy area opposite Alma street. To do this, NZTA would have to buy the houses at 5, 5A, 7 and 7A princes street – but given the 67m budget (up from the 25m promised in the RC) and the 33m cost estimate for Seapath – spending 10m on land acquisition does not sound unreasonable. That land could also be then used for building the toll station, security office, toilets and a bike rental shop. And that’s the difference between Labour and National. The difference between those with an eye to the future and those rooted firmly in the past. Except we all know Labour is not in charge. I am not a fan of NIMBY Cindy, but she’s better than the racist that is really in charge. If you think Winston is in charge, I’d love to hear your explanation for the ban on Oil and Gas extraction when NZ First supports regional development. The ban on O&G exploration is only against new permits. It will be overturned when National returns to power. Something that is inevitable at some stage in the next decade. The refugee quota is much more telling of who is actually in charge. Cindy loves refugees – even ones that work for war criminals – But Winston said no and Cindy had to concede. NZ First got 7% of the vote (I am sure we can all agree that it is sad that NZ has so many racists) but they have 20% of the cabinet posts. Worse – he even got Cindy and the Greens to back his anti democratic Waka Jumping bill, which enables a part leader to dismiss an elected MP – no wonder the Greens said it was ‘swallowing a dead rat’. I am sure that this coalition government will be looked back on as a huge mistake. The Euphoria of getting the most popular party out of Government will be met with the realisation that Cindy’s ‘I want to be the youngest PM’ agenda was counter productive to the people she represents and NZs as a whole. I am not looking for an argument here Jezza – I would expect you to be a reasonable person and not support people like Peters or Trump. I would rather have an all Labour Govt or all Green Govt than the one we have. lol. This is so funny, it’s the official Hooton sourced Nat attack angle; ‘quick panic; it’s really Winnie in charge, cos we all know a young woman couldn’t possibly do it’. Is codswallop, of course, and such a desperate play, meantime in actual policy land, the new govt is going at a fantastic pace actually addressing all the serious issues the previous government didn’t have the brain power, and, especially, the imagination to even admit existed. I have just come from a housing launch in Mt Roskill. Tired old state houses replaced at a ratio of 4 to 1. Four times as many new dry, warm, affordable family homes, at a gentle suburban density on 1/3 1/3 1/3; market, Kiwibuild, Social ratio. Genius. By understanding that access to affordable, healthy, well located homes is the foundation to a successful society and working out how to deliver them, this government will have both a long future and a high reputation. By only considering housing as an asset class and nor a social necessity, it is the previous govt that will be seen as an unfortunate mistake. I’m no fan of NZ First and think we should have much higher refugee quota than we currently have. I just don’t agree with that Winston is running the government, just because he is getting his way on some policies. Labour is running the agenda for the big policies – health, welfare and education, and is also in charge with transport with airport LR that the Greens also support, happening ahead of HR that NZ First support. NZ First make up 14 % of the seats in the government and 16 % of all executive positions, that’s hardly ‘controlling the government’. We shall see how things develop Jezza. I hope you are right, but things like the waka jumping bill should have everyone concerned. As for Patrick applauding the performance of this Govt vs the last – time will tell, but business confidence is down, the NZD retrenching, inflation rising…all indicators that ‘Something is rotten in the state of NZ’. Building ‘affordable homes’ with a 600k price tag does not sound very ‘Genius’ to me. Encouraging people into that sort of debt with only a 5% deposit even less so. Doing all of this in a housing market the Government is actively trying to devalue is just economic suicide. Maybe Cindy was too young to remember the GFC? Sometimes – when your ideology is so fixed – you cannot accept anything is wrong. I believe this to be the case in America where Republicans are prepared to overlook the orange orangutans narcissism, simply because he is not a Democrat. I believe the same is happening in NZ, where some people are willing to accept all the failings of this coalition – refugee quotas, erosion of democracy (Waka jumping bill), broken promises, a stalling economy and Winston racist Peters – all because it is not National. It’s good that business confidence is down, in New Zealand it’s inversely correlated to GDP growth. I agree with you regarding the Waka jumping bill, however I think you are making mountains out of molehills. All governments do things undemocratic and all governments break promises yet the country rolls on. I’m far more concerned about things that will impact the country in the future such as transport, housing, conservation etc than whether a rouge MP can change party or not, or whether we choose a nominal 750 or nominal 1500 refugees (neither number will solve any of the worlds problems). I haven’t seen one bit of evidence that this government is causing the economy to slow, I doubt they have much influence over it to be honest. Our economic cycles are influenced by forces way beyond any of our governments control.